Wright Preserve - Haddam Land Trust, Inc. 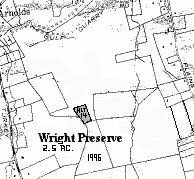 The Wright Preserve was donated by Mary Wright in 1996. This 2.5 acre preserve is off of Gulf Quarry Road and lies between Plains Road and Turkey Hill Road. It is landlocked.